The Snake River is the largest tributary of the Columbia. The river begins in Northwestern Wyoming south of Yellowstone Park and west of the Continental Divide at an elevation of just over 9,800 feet. 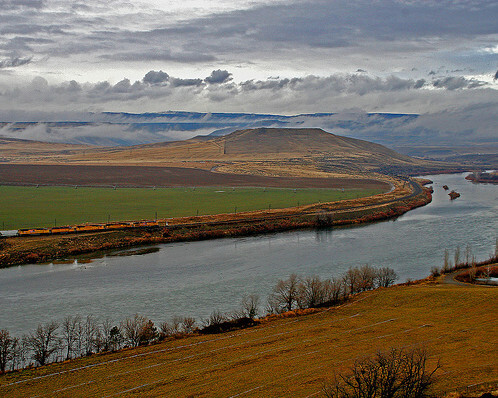 From there, where several small streams converge to form the river, the Snake flows south for more than 100 miles before turning west into Idaho and flowing across the southern part of the state, and then north to its confluence with the Clearwater at Clarkston, Washington, and Lewiston, Idaho. From there the river flows west through southern Washington to its confluence with the Columbia a few miles south of Pasco. At the confluence, the elevation of the river is 340 feet above sea level. Thus in its 1,078 miles the Snake drops more than 9,400 feet, a step decline. There are a number of waterfalls across southern Idaho. Early French fur traders called the Snake a “mad river,” apparently for good reason. The annual discharge of the Snake into the Columbia is 36 million acre feet (1962-2016, measured at Ice Harbor Dam), or about 19 percent of the annual discharge of the Columbia into the ocean. The Snake drainage basin encompasses 92,960 square miles, or about 36 percent of the entire Columbia River Basin. Obviously, while vast, the Snake River Basin is quite arid. The rapid descent and rocky canyon of the Snake made it a good river for hydropower development; the first hydropower dam was built in 1900 at Swan Falls and supplied electricity to the Trade Dollar Mine at Silver City 28 miles away. The Snake also is heavily tapped for irrigation. Above Milner Dam, near Burley, Idaho, virtually the entire flow of the river is pumped or diverted. Downstream of Milner Dam, the Snake is replenished by springs and tributaries, essentially amounting to a reborn, or second river. The Snake has been called the lifeline of southern Idaho and the multi-billion-dollar agricultural industry in that part of the state. Hydropower dams and irrigation facilities were developed simultaneously along the Snake, as pumping facilities were powered by electricity and communities developed around the farm settlements. The last major dam was completed in 1975 — Lower Granite, a federal dam in Washington. In all, there are 22 hydropower dams on the mainstem Snake River — 15 in Idaho, three on the Idaho/Oregon border, and four in Washington. The Snake produces more than 1,100 megawatts of electricity — enough for the city of Seattle — and the water withdrawals irrigate 3.8 million acres. Before the construction of dams, the Snake produced huge volumes of salmon and steelhead, and the fish spawned in the mainstem and in tributaries as far inland as Shoshone Falls about 600 miles from the confluence with the Columbia. Salmon passage today ends at Hells Canyon Dam, at river mile 247. In its upper reaches, the river remains a popular destination for sport fishing and water recreation; Hells Canyon, the deepest river gorge in North America, is a national recreation area. The river was named after Indians who lived along its shoreline in present-day southeastern Idaho. Early European fur traders noted that the Indians marked their territory with sticks that showed an image of a snake. The Indians also greeted people by making a snake-like hand motion. Snake River Canyon. Photo: flickr.